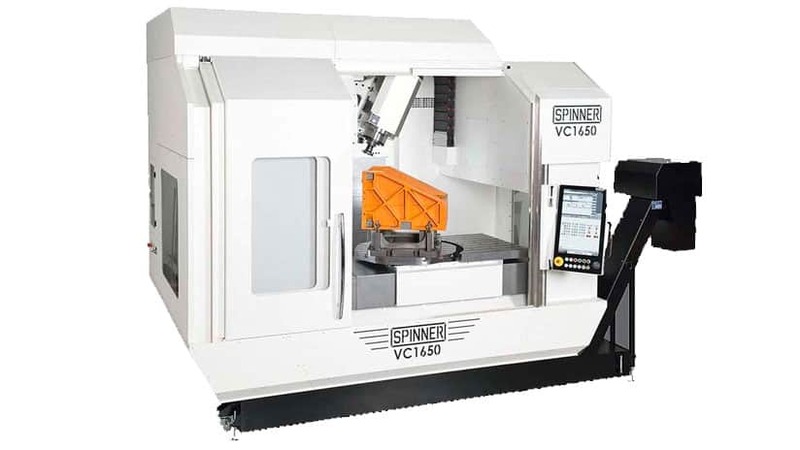 Anyone needing to machine complex components weighing up to two tonnes within an 820 mm cube may wish to review the new VC1650 5-axis machining centre from German manufacturer, Spinner, represented in the UK and Ireland by sole agent Whitehouse Machine Tools, Kenilworth. 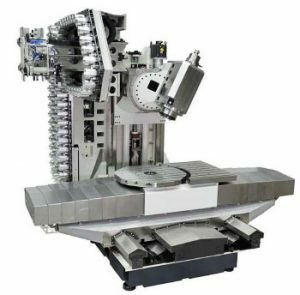 Rigidity and accuracy are assured by deploying a +1°/-110° B-axis spindle to provide the fth CNC axis, avoiding having to swivel the rotary table. 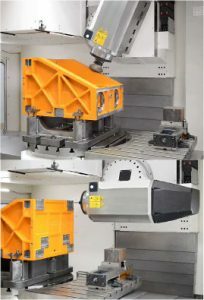 A xed table to the right of it allows workpieces up to 1,650 mm long to be supported horizontally for 3-axis metalcutting, extending the machine’s versatility. The spindle head centreline is o set by 200 mm to the left of its centre of rotation to allow features closer to the table to be machined. Notable also is the patent-pending method of protecting the table’s Y-axis guideway from swarf and coolant ingress using a single wiper system, eliminating the need for a telescopic cover. The depth of the machine is consequently shorter, leading to a 30 per cent reduction in overall footprint. As the table moves to the extremes in the X-axis, automated loading and unloading from the sides is simplified. Another characteristic of the machine is FEM-optimisation of the cast structure, which provides a high level of rigidity and vibration damping for elevated cutting performance and high standards of surface finish on machined components. Further advantages are that tool life is extended and accuracy of machining is enhanced. A user can choose from a vast array of alternative features and options, such as a 464 Nm high-torque spindle or a 18,000 rpm high-speed spindle, a 96-pocket magazine for SK50 / HSK100 tools or 138 pockets for SK40 / HSK63, 70 bar high-pressure coolant instead of 22 bar, linear scales in X, Y and Z, and either a Siemens 840D sl control with Spinner’s 24-inch Touchpanel 4.0 interface or a Heidenhain TNC640 with 19-inch screen. Often overlooked when drawing up a machine tool shortlist is the aspect of chip disposal. Spinner has optimised efficiency in this area by providing four spiral augers to deliver chips to a conveyor at the front of the machine for convenient removal. It also ensures negligible heat transmission and allows space on the shop floor to be saved when installing the 16-tonne machine. All Spinner machine tools are manufactured in its Munich factory. The medium-sized enterprise has delivered more than 20,000 since its inception in 1950 and currently sells in excess of 1,000 CNC machines per year. See the Spinner VC1650 5-axis machining centre in action on YouTube.